I made a day-trip on an early July Saturday to visit a few Santa Cruz Mountains winery tasting rooms along with winemakers and friends Bryan, Wes, Diane, Kyle, Alan, and Norman. The main purpose of the day was to visit Nora’s Vineyard just outside the town of Bonny Doon – most of our group would be getting some Pinot Noir fruit from there for the first time this year. Bryan (Harrington Wines) and Kyle (Coterie Cellars) own small wineries in San Francisco and San Jose, respectively, while the rest of us are planning to make a small amount of Pinot for fun, and Bryan had arranged for us to visit the vineyard that afternoon. Since members of our group were coming from different directions, Bryan suggested meeting for lunch in Santa Cruz before doing some wine tasting nearby and then heading to the vineyard. 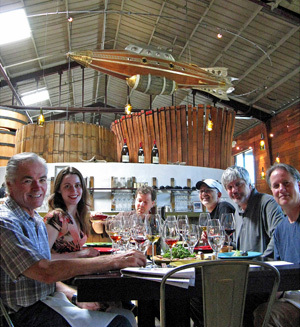 We had lunch at Le Cigare Volante, the restaurant run by Bonny Doon Vineyard. Known until recently as Cellar Door, Le Cigare Volante shares its name with the well-known Bonny Doon Rhône-style red wine. In keeping with the theme of the “flying cigar” (a French term similar to “flying saucer”), the restaurant advertises a “Roswell Hour” from 3-6pm, and features a large flying cigar hovering above the bar. Also notable are the many cowhorns that serve as decorative elements throughout the space – a nod to Bonny Doon’s move to biodynamic farming at its estate vineyards in the past few years. We enjoyed a very nice lunch of various small plates, which included a charcoal-grilled octopus salad, smoked fingerling potatoes with chives, a duck confit “cigar” (wrapped in a grapeleaf), and a smoked duck flatbread with blueberry and arugula – my favorite of the dishes we all shared. We had a long and relaxing lunch – with several bottles of wine, of course – so it was later than we’d planned by the time we headed out to do some wine tasting in the afternoon. But conveniently, Le Cigare Volante and the adjacent Bonny Doon tasting room are located within the Surf City Vintners collective. 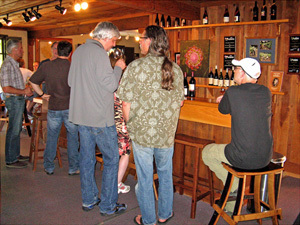 There are currently 13 wineries, along with cafés and shops, within a couple of blocks of one another just south of Highway 1 a short distance west of downtown Santa Cruz. Since we’d gotten a late start after lunch, we decided to focus mainly on tasting Pinot Noir, and our first stop was just a few steps away from the restaurant, at the tasting room of Vine Hill Winery. Vine Hill recently opened the Surf City Vintners location for their second tasting room, which they call The Barrel Room. Their original tasting room, which remains open as well, is at their winery in the Santa Cruz Mountains, overlooking Monterey Bay. Lore James was behind the tasting bar, and she greeted our group as we arrived. Vine Hill 2009 Pinot Noir, Santa Cruz Mountains. From Manildi, Zayante, Saveria, and Lester Family vineyards, about 30% new oak. Medium ruby color, this featured black cherry, herbs, lots of spice, and a touch of vanilla/oak. Medium-light bodied, it lacked a bit on the mid-palate but had a pleasant finish with mild tannins. Vine Hill 2008 Pinot Noir, “Sea Change,” Santa Cruz Mountains. Sourced from Hicks Family, Lester Family, and Saveria vineyards, 115, 667, and 777 clones, about 40% new oak. Medium-light color, with more intense cherry and strawberry fruit, earth, and spice on the nose. Medium weight on the palate with very good balance, this had moderate tannins. Cumbre 2008 Pinot Noir, Raffaelli Vineyard, Santa Cruz Mountains. Mostly Pommard along with 115 clones, 50% new oak. Medium color, displaying more earthy aromas, along with black cherry and plum, mushrooms, and a touch of herbs. Somewhat bigger-bodied with a lively mouthfeel, this finished with medium tannins that had a chalky texture, quite nice. Cumbre 2007 Pinot Noir, Hicks Family Vineyard, Santa Cruz Mountains. From 667 and 115 clones, 50% new oak (all Taransaud barrels). Medium color, this showed a brighter red fruit character with more spice and black pepper notes, along with a savory element. Noticeably more structured, this finished with grippier tannins. A promising wine that will need additional time to mellow out. Vine Hill Winery has one of the longest histories of any current producer in the Santa Cruz Mountains. The winery and estate vineyard is east of Highway 17, between Summit Road and Highway 1. Its roots go back to the mid-1860s, when brothers George and John Jarvis purchased property and planted vines there. In just a few years, the area became known as Vine Hill, for the many vineyards on the hillsides – by the 1870s, there were nine vintners operating in the area and the Jarvis brothers’ winery was producing around 14,000 cases per year. John Jarvis planted the Union Vineyard in 1877 at the current Vine Hill Winery site – in the early 1890s it included Zinfandel, Riesling, Sauvignon Blanc,Sémillon, and Mourvèdre among its plantings. The property changed hands several times over the years. Famed Santa Cruz Mountains vintner David Bruce purchased it in 1968 and planted the vineyard to Pinot Noir the following year. Bruce in turn sold it in 1974 to Ken Burnap, whose Santa Cruz Mountain Vineyard produced a number of legendary Pinots from the property. Burnap sold the property in 2004 to a group headed by Nick Guerrero, now the managing partner of Vine Hill Winery. He earned a degree in fermentation science from UC Davis in addition to other degrees. Nick and his wife Celeste had been home winemakers since 1992 before founding Vine Hill. Winemaker Sal Godinez arrived at Vine Hill in 2005, having worked previously at Freemark Abbey and for nine years at Saintsbury, where he made Pinot Noir with winemaker Byron Kosuge. Vineyard manager Rachel Ormes helped earn the estate vineyard organic certification from the California Certified Organic Farmers (CCOF) – the 2010 vintage was the first from the vineyard using certified organic grapes. The 26-acre Vine Hill property is at an elevation of about 1,100 feet. Seven acres are planted, mostly to Pinot Noir along with a little Syrah. The vineyard was replanted following the 2004 ownership change, and the replanting was completed in 2007. Vine Hill purchases fruit from a number of other vineyards as well. Miller Vineyard is nearby the estate vineyard, while Raffaelli Vineyard is located in the Rodeo Gulch area south of Vine Hill. Its Pinot vines were planted in 1989. Manildi Vineyard is not far away, in the Soquel area. Hicks Family Vineyard, off of Pleasant Valley Road in the Corralitos area, was planted with Pinot Noir in 2001. Saveria and Lester Family vineyards are also in the Corralitos area, about ten miles southeast of Vine Hill. Zayante Vineyard is farther west, in the mountains north of Felton. Vine Hill Winery produces wines under three different labels. 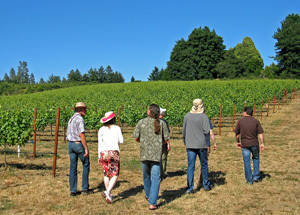 Gatos Locos of Vine Hill is the largest production brand, at about 3,500 cases per year, and includes Syrah, Zinfandel, and a red blend in addition to Chardonnay and Pinot Noir. The Vine Hill label focuses on Chardonnay and Pinot, but also has Riesling and Syrah in the line-up. Annual production of the Vine Hill brand is less than 1,000 cases. Cumbre means “summit” in Spanish, and the Cumbre label is meant to represent the pinnacle or summit of wine from the Santa Cruz Mountains, with limited releases of Chardonnay and Pinot Noir. Lore told us a little about the winemaking as we tasted four Pinots from the Vine Hill and Cumbre labels. All of the Pinot fruit is destemmed, and the wines are aged in a variety of French oak barrels, mostly François Freres and Taransaud. New oak ranges from 30-50%, depending on the wine. We tasted two single-vineyard Pinots and two that are blends from multiple vineyard sources. The “Sea Change” Pinot bottling, first introduced about two years ago, is sourced from vineyards in the Corralitos area, closer to the coast than the Vine Hill vineyards. The two single-vineyard bottlings represented two different parts of the Santa Cruz Mountains – Raffaelli Vineyard from Rodeo Gulch and Hicks Family Vineyard from Corralitos. Lore, who joined Vine Hill in 2008, did a great job in leading our group through the tasting – she was very knowledgeable about the wines, the winery, and the Santa Cruz Mountains wine region in general. The Raffaelli Pinot was my favorite of the wines we tasted, with the Hicks Family Pinot not far behind. Both wines should age well. I’ll have to take the time one of these days to visit the winery and estate vineyard, but for those with more limited time – as we were on this day – a visit to the Vine Hill Barrel Room at Surf City Vintners is a fine choice. Our next stop was just across the parking lot, at Santa Cruz Mountain Vineyard and Quinta Cruz. Cynthia Bournellis welcomed us, and we squeezed in front of the small tasting counter located in a front corner of the winery. Unlike Vine Hill, Santa Cruz Mountain Vineyard makes their wine at their space at Surf City Vintners. But they do share a significant part of their history with Vine Hill. Quinta Cruz 2011 Albariño, Bokisch Vineyard, Clements Hills. Light color, with pear, stone fruit, and mineral aromas, along with touches of spice and lees. Medium-bodied and bright in the mouth, with a lively finish, nice. Santa Cruz Mountain Vineyard 2009 Pinot Noir, Branciforte Creek Vineyard, Santa Cruz Mountains. 100% Pommard clone. Medium garnet color, featuring very aromatic black cherry, pepper, dried herbs, and spice. Medium weight with very good balance and structure, finishing with moderate tannins, a Pinot that’s showing well now but should age for years, very nice. Quinta Cruz 2009 Graciano, Bokisch Vineyard, Mokelumne River. Medium-dark color, this had earthy plum and darker fruits on the nose, along with pepper and spice. More full-bodied but not heavy, this had a grippy finish. Quinta Cruz 2006 “Rabelo” Dessert Wine, Late-Bottled Vintage, Pierce Ranch, San Antonio Valley. 50% Tinta Roriz, 25% Touriga Nacional, 25% Tinta Cão. Medium-dark color, with dark berry fruit, chocolate, brown sugar and spice aromas. Moderately sweet, this had very nice balancing acidity and a lingering finish. Ken Burnap launched the Santa Cruz Mountain Vineyard label in 1975, after he purchased the property on Vine Hill from David Bruce, and he made his first wines that same year from the Pinot Noir vines that Bruce had planted there. That 1975 Pinot made a splash in the wine world, and within a couple of years, Burnap branched out into other varieties. In 1977 came the winery’s first Cabernet Sauvignon and first Durif (better-known in California as Petite Sirah), with fruit for both purchased from other Santa Cruz Mountains growers, and in the 1980s Merlot and non-estate Pinot were added to the line-up. Other grape varieties and vineyard sources have come and gone over the years, but Pinot Noir, Cabernet Sauvignon, and Durif have been the mainstays for the winery to this day. Ken Burnap decided to retire in 2003, and the following year he sold the winery building and the vineyard to the group that established Vine Hill Winery on the site. But he sold the business itself, together with the winery equipment and wine inventory to Jeff Emery, who had started working with Ken at the winery in 1979, while Jeff was still pursuing a degree in geology from UC Santa Cruz. Beginning as an apprentice, Jeff eventually ran all the winery operations by the time that Ken retired. 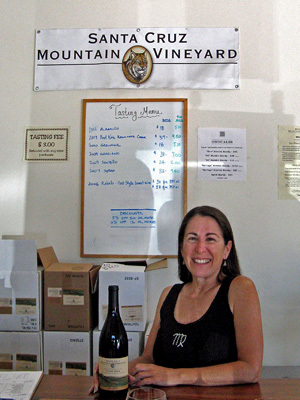 Jeff took over Santa Cruz Mountain Vineyard in July 2004, and he moved the winery to a new space near Boulder Creek. In 2008, the winery was moved to its current location in Santa Cruz. As 2003 marked the last Pinot from the old estate vineyard, Jeff had to find new sources for fruit. He turned to two locations, both of them located in the Vine Hill area not far from the old vineyard. Bailey’s Branciforte Ridge Vineyard was planted in 1999 with 115 and 667 clones of Pinot Noir, while Branciforte Creek Vineyard was planted in 1988 entirely with Pommard clone. This site – only about a mile from the old estate vineyard – was once part of the Jarvis Brothers’ original 1860s vineyard. Despite their geographical proximity, it’s been my experience that the Pinots from these two vineyards are quite distinct from one another, with the clonal difference perhaps being the defining factor. The Bailey’s Branciforte Ridge bottling tends to be bigger and more fruit-forward, while I’ve found the Branciforte Creek to display more earth, spice, and mineral components – although the 2009 that we tasted had no shortage of fruit. Still, in the overall spectrum of California Pinot Noir, these are both restrained and elegant renditions, and they’ve been among my favorites from the Santa Cruz Mountains. The winery’s current releases include the two Pinot Noirs, Cabernet Sauvignon from Luchessi Vineyard in the Santa Cruz Mountains, and Durif from Shepherd Vineyard in the Saratoga area of the Santa Cruz Mountains. There’s also Grenache from McDowell Valley Vineyard in Mendocino, Syrah from Santa Lucia Highlands, and Petite Sirah from Pierce Ranch in the San Antonio Valley AVA in southern Monterey County. In addition, they still have some of the last Pinot bottlings from the old estate vineyard available for sale. In 2008, the winery launched a second label, Quinta Cruz, which focuses on wines from Spanish and Portuguese grape varieties. The idea for Quinta Cruz came about from Jeff Emery’s travels in Portugal and experiencing some wonderful table wines there. The boat on the label is a Rabelo – a traditional boat that would take new Port wines down the Duoro River. In the few years since their introduction, the Quinta Cruz wines have taken a place among the leaders in California wines made from Iberian varieties. I ended up tasting three Quinta Cruz wines at the tasting room. This included an Albariño – a new release, this is the winery’s first from this grape variety. Both this wine and the Graciano come from Bokisch Vineyard in the Lodi area, while other wines come from Pierce Ranch and from Silvaspoons Vineyard in Lodi – all vineyards that are among California’s best sources of Iberian-variety grapes. Other current releases include Verdelho, Tempranillo, “Concertina” (a blend of Tinta Roriz, Touriga Nacional, Touriga Franca, and Tinto Cão), Touriga, and “Rabelo” – a Port-style wine. Graciano is often blended with Tempranillo in Rioja, and it’s seldom bottled on its own in Spain or in California. The “Rabelo” is unique in that it is fortified with an alambic brandy made from the same grapes from the same vineyard as the fruit that forms the basis of the wine. Quinta Cruz has the brandy made by a small distillery in the Santa Cruz Mountains called Osocalis. Jeff Emery’s wines at both Santa Cruz Mountain Vineyard and Quinta Cruz show a fine sense of place, and are typically marked by lower alcohol, higher acidity, and an understated use of oak. I’ve been impressed by these wines for years. Food-friendly and age-worthy, the Pinot Noirs in particular are some of the most distinctive produced in the Santa Cruz Mountains. Cynthia was a most congenial host at the tasting room, and we all enjoyed our visit. After we said goodbye to Cynthia, we hopped into our cars and drove up the coast along Highway 1 for a few miles, then turned inland along Bonny Doon Road. Before long, we came upon the tasting room for Beauregard Vineyards, our next stop of the afternoon. I’d been to this spot a few times before – up until a few years ago, this was the tasting room of Bonny Doon Vineyard. The historic building had once been a general store and later gained some notoriety as the Lost Weekend Bar until Randall Grahm of Bonny Doon bought it in 1983. It’s a sizable space with a large “L”-shaped tasting bar as well as a smaller bar in the back for when things get crowded. We found some room along the side of the main bar, where Suzanne Keister-Zeber poured us some of Beauregard’s current releases. Beauregard 2009 Chardonnay, “Métallique,” Estate, Santa Cruz Mountains. From Meyley Vineyard, made entirely in stainless steel. Light yellow-straw color, displaying bright lemon and nectarine fruit along with hints of smoke and herbs. Fairly light and lively on the palate, with a crisp and pleasant finish. Beauregard 2009 Chardonnay, Estate, Ben Lomond Mountain. From Meyley and Bald Mountain vineyards, made in neutral oak. Medium-light color, this showed citrus and apple along with spice and lees notes. Creamier mouthfeel with a bigger structure and slightly rough finish that should smooth out with another year or so in the bottle. Beauregard 2010 Pinot Noir, Byington Vineyard, Santa Cruz Mountains. Light ruby color, with intense strawberry, cranberry, and herb aromas, with undertones of spice and oak. Medium-bodied, this had good structure but was not overly tannic, showing very well for such a young Pinot – nice wine. Beauregard 2008 Pinot Noir, Bald Mountain Vineyard, Estate, Ben Lomond Mountain. Medium-light color, black cherry, earth, baking spice, and a touch of funk on the nose. Bigger mouthfeel than the previous wine with more tannic grip, the finish tailed off a bit quickly. Beauregard 2010 Syrah, Nelson Family Vineyard, Santa Cruz Mountains. Bottled a week earlier. Medium color, this featured somewhat tart red fruits, earth, and a citrus note. Medium weight and showing plenty of acidity along with moderate tannins, this is very young and needs time to come together. Beauregard is another Santa Cruz Mountains winery with a long history. Amos Beauregard first planted 13 acres of Chardonnay, Pinot Noir, and Cabernet Sauvignon at an old apple orchard on his Beauregard Ranch in 1949, selling much of the fruit to Napa wineries. His son Emmit (Bud) farmed the vineyard while also running the family grocery store in Santa Cruz. Bud’s son Jim Beauregard increased the family’s plantings and was also a partner in the old Felton Empire Winery (now part of Hallcrest Vineyards) from 1976 to 1984. Jim remains the winery’s main viticulturist. Ryan Beauregard is now the fourth generation of the family to grow winegrapes in the Santa Cruz Mountains. Ryan established the Beauregard Vineyards label in 1999 and is the winemaker there. Jim and Ryan currently farm 105 acres of vineyard land, and the winery produces about 5,000 cases per year. There are now four Beauregard estate vineyards – Bald Mountain Vineyard, Beauregard Ranch, Meyley Vineyard, and Nora’s Vineyard – all located within the Ben Lomond Mountain AVA of the Santa Cruz Mountains. Winegrapes had first been planted in the area in the 1800s, and in 1905 the Ben Lomond Wine Company had over 400 acres of vineyards. Prohibition spelled the end for most of the area’s vineyards, and since the end of Prohibition, new plantings have been on a much smaller scale. At 38 acres, Bald Mountain Vineyard is the Beauregard’s largest planting – in fact, it’s said to be the largest vineyard in the entire Santa Cruz Mountains. Chardonnay takes up most of the vineyard, along with nine acres of Pinot Noir (Pommard, Mt. Eden, and 777 clones). Beauregard Ranch is still the original 13-acre site, with Zinfandel added to the original grape varieties planted there. The 12-acre Meyley Vineyard was planted in the early 1980s with Clone 17 (aka Robert Young Clone) Chardonnay. The family’s newest vineyard is Nora’s Vineyard – more about that site later. The Beauregard wines focus on fruit from vineyards in the Santa Cruz Mountains AVA, with much of the fruit coming from their estate vineyards. Various Chardonnay and Pinot Noir bottlings dominate the wine line-up, though the winery also produces Syrah, Zinfandel, and Sangiovese, as well as two wines under the Lost Weekend label – a Sémillon / Sauvignon Blanc white blend and a “Super-Tuscan” style red blend. 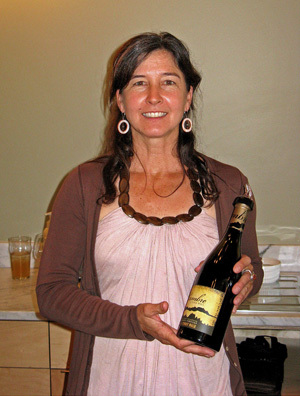 Suzanne poured us five of the current Beauregard wines – two Chardonnays and two Pinots, plus a brand-new Syrah. One of the Chardonnays – the “Métallique” – is one of a growing number in California that are made entirely in stainless steel. The Syrah had just been bottled recently and showed a need for more time to develop. Of the two Pinots, my favorite was the Byington Vineyard bottling, which was already showing nice complexity for a 2010 vintage wine. Just as it was in the past, the tasting room remains a fun place to stop, and the wines are worth checking out. We left the Beauregard tasting room and headed down the road a short distance to Nora’s Vineyard, where many of those in our group are expecting to get Pinot Noir fruit this year. Jim Beauregard planted the vineyard in 2008, and named it for his first granddaughter, born the same year. The site is still known to some in Bonny Doon as the “turkey ranch” – so named when the Simpkins family raised turkeys there in years past and the big birds could be spotted from the road. If nothing else, there’s probably lots of good fertilizer in the soil from those days! At an elevation of about 1,200 feet, Nora’s Vineyard is situated just above the fog line – an important consideration with many coastal vineyards. The 20-acre vineyard is planted entirely to Pinot Noir, with 115, 667, 828, and Pommard clones in separate blocks. All of the vines are grafted to 101-14 rootstock. There’s a gentle slope down the hill toward the road, and the vineyard rows run north-south. While there is a good depth of topsoil at the site, there is limestone beneath this. In fact there’s an old limestone quarry (in operation until just two years ago) not far south of the vineyard. The vineyard produced its first crop in 2011. Bryan Harrington had called ahead to arrange our visit to the vineyard. Unfortunately neither Jim nor Ryan Beauregard were available that afternoon to show us the vineyard themselves, but they told Bryan that we were free to take a look without them. As we walked along the vineyard rows, we were pleased to see that the vines looked very healthy and that the fruit set looked good. If anything, the vines were perhaps a bit too vigorous, but there was still plenty of time in the growing season to deal with that through vineyard management techniques. It would have been great if the Beauregards had been there to show us exactly where the various Pinot clones were located within the vineyard, but it was still a most useful visit. We did notice that the vines at the upper portion of the vineyard showed considerably less vigorous growth, but we were not sure whether that was due to the soil in that area, a different Pinot clone, or some other reason. Eventually we headed back down the slope to the road, where we’d parked our cars just outside the vineyard gate. From there we all headed our separate ways. This was an enjoyable trip, and the fact that we spent just one afternoon to visit three tasting rooms and a vineyard was a good demonstration that the Santa Cruz Mountains wine region is not really as far away from the heart of the Bay Area as it sometimes feels. The collection of tasting rooms at Surf City Vintners in Santa Cruz makes it easy to sample a number of good wineries without having to drive the twisting roads through the mountains to get from one to another. We were able to taste a nice cross-section of Pinot Noirs from various parts of the Santa Cruz Mountains AVA, and we had a great time at each of the tasting rooms – all shared a casual, low-key atmosphere and friendly, knowledgeable hosts. As always, thanks to everyone that we visited for being so generous with their time and their wine!